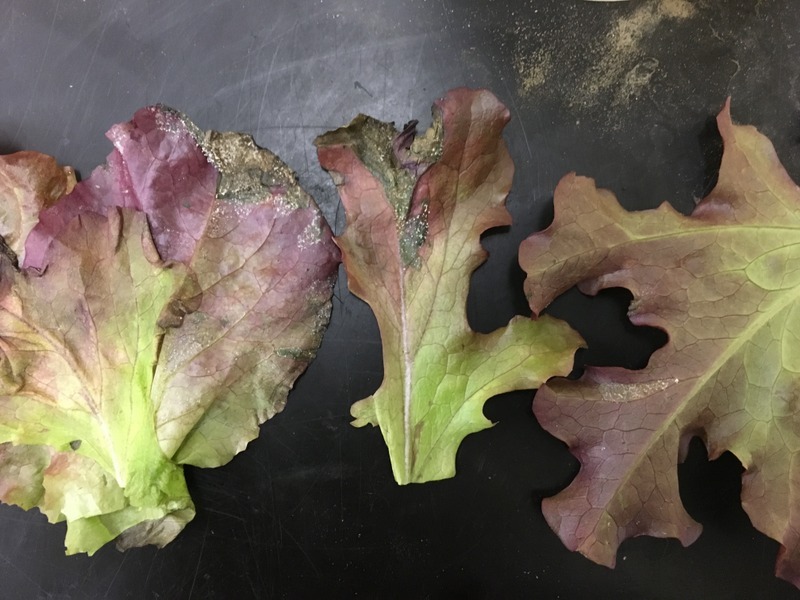 Downy mildew (Bremia lactucae) is a common disease of lettuce in cooler growing environments, where temperatures are low and there are long periods of leaf wetness caused by overnight dew. 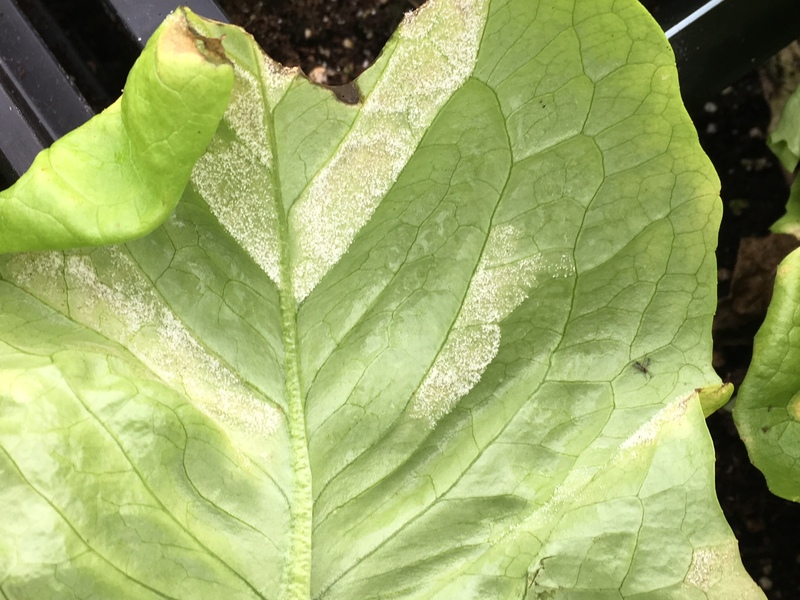 These conditions are common in late-fall and in cool season greenhouses, and this fall we have seen downy mildew in field lettuce and in a heated winter greenhouse. Symptoms can include white sporulation on leaf surfaces and growers may see the white growth on leaves and assume they have powdery mildew. Importantly, downy mildew requires cool weather and leaf wetness while powdery mildew occurs during warm weather and under dry conditions. Downy mildew is caused by an oomycete like late blight and powdery mildew is caused by a fungus, so fungicides used to control one may not control the other. Be sure to properly identify the pathogen or submit a sample to the diagnostic lab. The disease causes leaf yellowing in angular patches, as the spots are vein-limited. On red varieties the initial spots may appear more grayish and water-soaked. Under humid conditions, white crusty sporulation forms when sporangiophores emerge from stomata and produce sporangia in distinct white projections, as with brassica downy mildew. Sporulation usually forms on the underside of the leaf but may also be seen on the upper leaf surface. Later, lesions turn tan or brown and papery as the tissue is killed. Older leaves close to the ground usually are the first to show symptoms. Downy mildew can reduce yields and quality of the crop. Infected wrapper leaves must be removed at harvest. Infections on the cap leaves or of leaf lettuce may result in leaving heads or whole plantings behind in the field. Downy mildew damaged leaf tissue can be an entry site for secondary rot producing organisms. These rot organisms may compound crop losses in the field, and can also cause losses later when the lettuce is in transit. 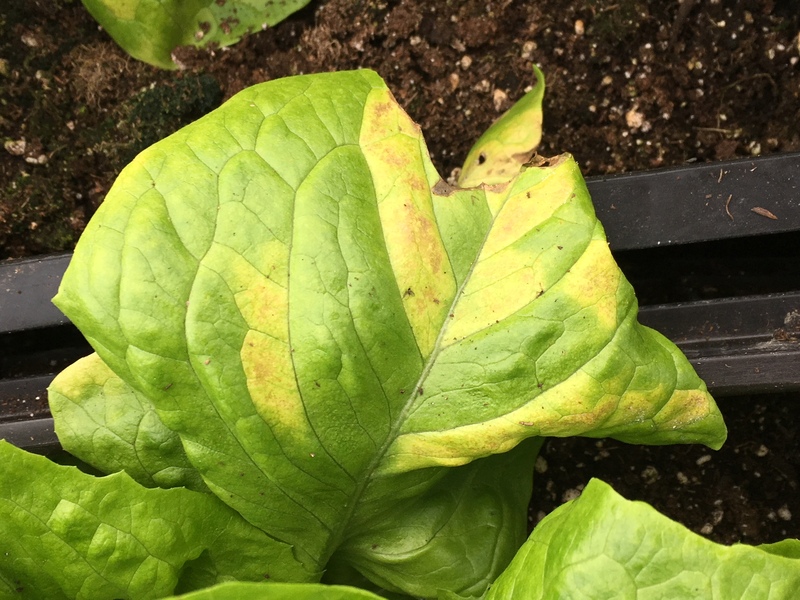 Damp, cool conditions and moisture on leaves are required for the pathogen to infect lettuce and cause symptoms to develop. The short-lived sporangia are dispersed by winds. Cultivated lettuce is the main host but it has also been reported on other plants such as artichoke, cornflower (Centaurea cyanus), and strawflower (Helichrysum bracteatum). Bremia lactucae is a complex organism, consisting of multiple races (pathotypes). New races continue to occur as the pathogen changes. Within each pathotype, some isolates have developed a lack of sensitivity to some fungicides. It is not entirely clear whether or not B. lactucae produces more persistent overwintering spores (oospores) in our area, or if it is blown in from other growing regions, or is associated with seed. Planting resistant varieties is the most effective and strategy for preventing lettuce downy mildew. However, choosing the right resistant variety necessitates that one knows which strain(s) of the pathogen is present. We are currently conducting experiments to determine the strain(s) present here in MA but this process may take some time. In the meantime, we are interested in hearing from anyone who has or has had the disease on their farm in the last few seasons to learn more about this disease and to compile a list of varieties which do and do not seem to get disease that growers could use. Please email or call Sue at sscheufele@umext.umass.edu  or 413-577-3976 and let us know when you have seen the disease and which varieties were and were not affected. Many fungicides are labeled to control downy mildew and can be effective if a spray program is started early, before disease occurs when conditions are favorable. Oomycete-specific materials (e.g. Tanos, Ranman,Curzate) should be mixed with a broad spectrum fungicide (e.g. mancozeb or copper). For organic growers, contact fungicides e.g. Oxidate or Milstop on a tight spray schedule (no residual activity) have been found by growers to be most effective. See the New England Vegetable Management Guide  for a complete list of registered fungicide. Check labels for pre-harvest intervals.